A brief notice issued by a German gas station stating that it will stop selling the tabloid Bild after its sensationalist coverage of the Germanwings crash, is gaining colossal resonance. Increasing numbers of retailers are removing it from their stands. What started with a Facebook entry by ARAL station in the town of Bendorf, Rhineland-Palatinate, is now going viral with the original post getting more that 100k ‘likes’ in less than a week. The message from the petrol station’s manager was clear when he set out his reasons for informing his customers that Bild would no longer be available at the pumps. He believed the newspaper’s reporting was too sensationalist and quick at jumping to conclusions, disregarding respect for the victims’ families as it posted images from the crash site. “Dear customers, there is no Bild-Zeitung today! We do not support this smear campaign!” the message read referring to the publication’s coverage of Germanwings flight 9525 crash in Alps on March 24. After receiving several comments such as “with the fall of Germanwings, journalism in Germany has crashed,” the boycott campaign spread like a wildfire to other retailers in Germany. A newspaper retailer in Rutesheim, a German town located in Baden-Württemberg, has followed suit and has taken Bild off of its shelves. That post received more than 50k ‘Likes’. Taxi and gas stations in Papenburg and Leer were also quick to sign up to participate in the boycott. As the campaign spread, activists even created a map of ‘Bild free’ retailers across Germany. 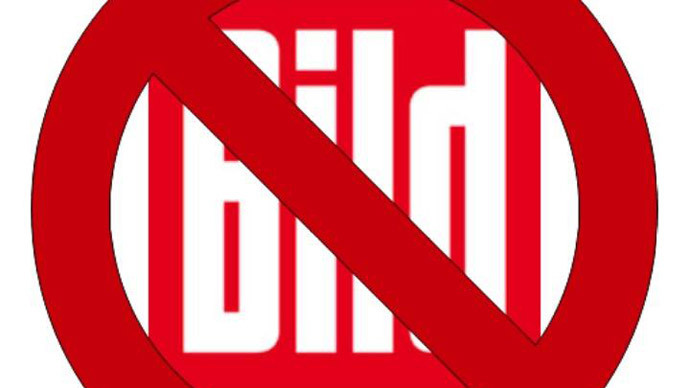 Another webpage called for a complete boycott of all products by Axel Springer AG which controls Bild. Activists accuse Bild of often erroneous and biased reporting and publishing “untrue and sloppily researched” articles. Germanwings Flight 9525 en route from Barcelona–El Prat Airport to Düsseldorf, Germany, crashed on 24 March some 100 kilometers northwest of Nice, in the French Alps. All 144 passengers and six crew members were killed. French and German prosecutors believe that the crash was intentionally caused by the co-pilot, Andreas Lubitz, who had suffered from psychological issues.